A year after this ordeal began, we still had no church board to make decisions or provide leadership in the church. Emily Freeman Penfield was working to put together the board, which had to be approved by the cabinet. She was told that none of the people who signed the letter of complaint against the bishop would be considered. That meant that no long-time members of the church would be appointed to the board. It meant that none of the previous leadership would be appointed to the board. It meant that the people who ran our housing ministry, clothes closet, and kitchen would not be appointed to the board. It meant that the nurses who started our health clinic and worked in it every Sunday would not be appointed to the board. It meant that the founding members who had passionately built this ministry for 18 years would not be appointed to the board. Many of us had been asked to serve on the board by a previous pastor. Clearly the decision not to allow us to serve was retaliation for filing a complaint against Bishop Willimon. This was just another effort to silence us. In the middle of the month, Emily announced that she was unable to continue as our pastor. We were told Matt Lacey would become our senior pastor. Once again, there was no consultation with the church about these changes. We were merely notified. November, 2011. We hold a non-board meeting and are denied a charge conference. No board had met to make decisions about the church since before April 1, 2011. We didn’t have a nominating committee meeting, didn’t have a budget, and were tired of being told decisions couldn’t be made because we were in transition. We called a meeting of the board, although we were told by Pastor Lillian that it was out of order. Thirty people attended. Among other business, we unanimously passed a resolution against an appointed board, nominated officers, and prepared as best we could without pastoral support for the upcoming charge conference. 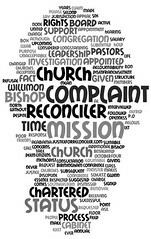 Two days later we received an email from Bishop Willimon stating that our votes at the board meeting had no meaning, and that Church of the Reconciler would not be included in the mass charge conference being held the next day. In fact, Church of the Reconciler would have no charge conference at all. We had been designated a mission church and no longer had any say in the running of our church. 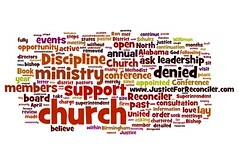 We were later told that a celebration of Church of the Reconciler was held at the mass charge conference, but while our ministry was held up as an example of mission and ministry, those of us who had built that ministry were being removed from office and denied a voice in our own church. Tuesday, October 11, 2011. We seek justice. Tuesday, October 11, 2011. Twenty-nine members and active friends of the church filed a complaint against Bishop Willimon with Bishop Alfred Gwinn of the Southeastern Jurisdiction. We asked for an investigation into the effort to remove the church leadership and the complete lack of consultation and engagement with our members. Bud Precise and Lillian Eddleman met with the SPRC and informed us that Bud would be leaving as interim pastor, and Lillian would become the only pastor of the church. Once again, we had had no consultation with Ron Schultz concerning these changes. We were merely notified of the decision. In addition, we were notified yet again of plans to replace the lay leadership of the church with an appointed board. We were told that this was good for the church because it would broaden the support for our ministry. There seemed to be no awareness of the irony that Ron Schultz had ended the successful effort we had made for many years to have associate and affiliate members in order to broaden that support, only to replace all of the current leadership under the pretense of letting other churches have a say in our ministry. At this meeting, we were told that Ron Schultz was ready to meet with us within the week to explain how this new, appointed board would work. When we made clear our willingness to meet with him as long as he understood that we would make no decision about a change in leadership at that time. Lillian assured us that the change would happen only in accordance with the Discipline. She told us there would be a charge conference and we would vote on any change in status. The meeting with Ron Schultz never happened.